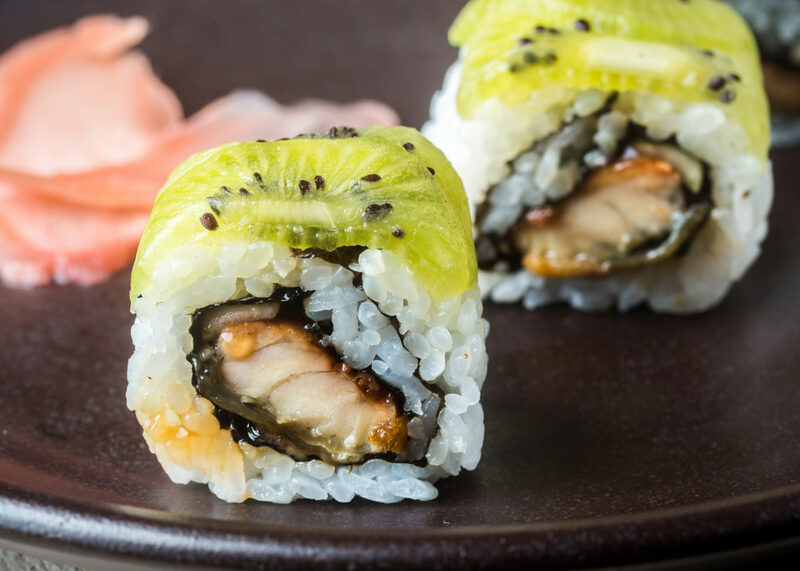 A while ago when we make the New Zealand Roll, one of our readers suggested we try making an unagi roll with kiwifruit on top (rather than a California roll with kiwifruit on top, which is what the New Zealand Roll is.) He was right… the roll turned out wonderfully! Son really liked it, and we would definitely recommend it to anyone who likes unagi and kiwifruit. It’s been forever since I have had kiwifruit – for the longest time, I didn’t even know if I like it or not. I remember having some kiwifruit ages ago in preschool, but I don’t think my parents ever had any around, so I hadn’t had any until a few months ago when I made the New Zealand Roll. Same thing with peaches… I haven’t eaten those since I was a little kid either. I used to love them… until I was maybe two years old and I had an incredibly sour peach. My parents have before and after pictures of me eating that peach… before I bit into it I had a huge smile on my face, and after… my face was all scrunched up because it was so sour. I still don’t eat peaches – I’ve been scarred for life. Maybe I’ll make a sushi using peaches… now there’s a thought! Makes 6 rolls, or 36-48 pieces. Cook the unagi according to the package. Wash the cucumber and slice into long thin strips. Slice the unagi into long thin strips. Roll the sushi inside-out, using cucumber and unagi as your fillings. Place thin slices of kiwi fruit along the top of the roll, and use the rolling mat to press them into place. Serve with shoyu, wasabi, and ginger if desired. Enjoy! The Chinese might sue you for that as the kiwi fruit originated there! Good idea, though, as the fruit’s natural mix of seetnes and astringency will work well with the rice. Might be a good idea to use in small amounts with tuna! Robert-Gilles – Son’s right, it is commonly known as the kiwifruit. Mmm tuna and kiwifruit sound good! Son – Thanks for explaining that for me! 🙂 Love you! Thank you so much for the explanation!